Adventures of a BMX Mom: Excuse me. Where's the ladies' room? I must begin by giving my fabulous sister-in-law Ryland (pictured in St. Pete with William) a little credit for the notion of this post. She's been a race enthusiast since the early years, so she has learned the ins and outs of this business right along with me. Our first few event weekends were an extreme test of my germaphobia. I discovered quickly that restrooms at tracks remain locked (LOCKED?) during these hectic events to obviously avoid clogged toilets and ensuing floods. Instead, tracks are surrounded by a blue army of odiferous port-o-pots. Hand-washing is non-existent. Fortunately for me, I'm a distance runner. Many BMX tracks are located within city parks, meaning there is a restroom SOMEWHERE. I'm not afraid to sprint to the nearest one at the calling of nature, so I can at least wash my hands. There are times, however, when the restroom sprint fails. Our first race in Sarasota was in the spring of 2007. Wyatt was three at the time, and not yet racing. I had cased the joint for restrooms upon arrival, so I knew there was one at a nearby ball field. Wyatt's universal symbol for "business" has always been two fingers raised in the peace sign. Seeing this during a race was not fun, as three-year-olds typically require a certain amount of assistance in the clean up department. Knowing I had to face the music, and quickly, I grabbed Wyatt up, and sprinted to my designated location. LOCKED. (LOCKED?) Oh hell. Now what? No way no how was I putting Wyatt's sweet cheeks in a port-o-pot, and no way no how was I going to stand in there with him. Desperate, I got the truck keys off of BMX Dad and drove to the nearest location. Poor Wyatt was miserable, but we made it. January 2009 we were exposed to the most deplorable conditions I hope I ever see. The location: St. Pete BMX. The track itself was constructed atop a barren wasteland, which happened to be an old garbage dump. I searched as far as my eye could see, and there were no restrooms. 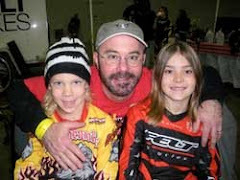 When BMX dad checked the moto board, we were shocked to discover that there were 188 motos. My bladder typically only lasts through 60, but I was determined not to use one of the SIX pot-o-golds. Yes, 188 motos and six port-o-pots. You do the math. Ryland and her husband Greg had come to spend the weekend with us and watch the boys race. Ryland and I enjoyed our share of adult beverages, so that only worsened our situation. Yellow-eyed and uncomfortable, we headed off to adjacent port-o-dooms. Sucking in a final breath of air, I went in. My God, what is wrong with people? I thought, fumbling with my belt. The bilge of a 17th century Atlantic vessel suddenly came to mind. Thank heavens I'm up on my immunizations. The bubonic plague must be rampant in here. Grateful for my strong quadriceps, I quickly came out of my hover and prepared for a speedy exit. Then..... clunk. Now, I'm not fancy by any stretch, but my Grandma always stressed the importance of fine accessories. There in that God-forsaken port-o-pot my most favorite belt buckle tumbled into the muck... I can't go on. It's far too upsetting. So much for clean bathrooms. I leave you with some important tips for attending BMX events. Always carry hand wipes, clorox wipes, a jug of water and some hand soap. Make friends with track officials. May I use the restroom key? I'll be discreet. Get a friend with a well-equipped RV. Man! I am glad that my 3 were all stage performers. We never had that problem. You are a brave and noble Mom!